These panels were installed into existing walnut door frames to replace cracked glass. Click on the chickadee to see an image of the complete doors. The bigleaf maple background has a beautiful tight ripple, and the trees depicted are bigleaf maple in the upper left corner, and hazel, both local natives, along with the chestnut backed chickadees. 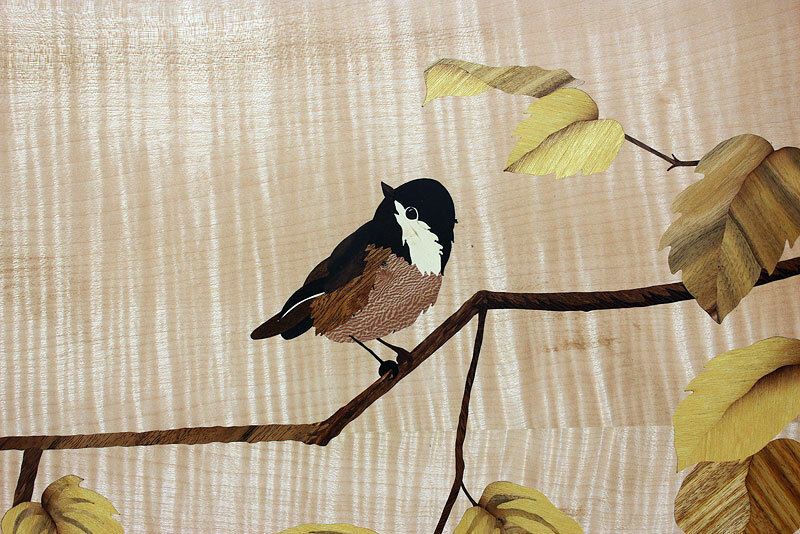 This summer I will be offering a marquetry class through the Cabrillo College Summer Arts program. And if the 2 day class is more than you are ready to sign up for, there is also an “Artist’s Doorstep” program with 90 minute visits in art studios. Sign up here for Sunday 20 May visits to my studio. Thanks for reading. Wishing everyone a wonderful spring!